On 4 November 2016, the Chinese Ambassador to the UK H.E. 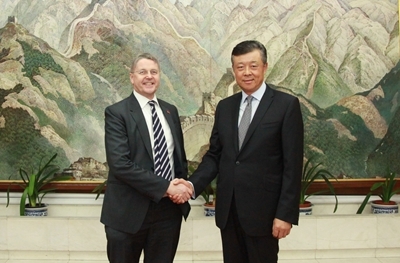 Liu Xiaoming met with Sir Jeremy Heywood, Cabinet Secretary and Head of the Civil Service, at the Chinese Embassy. Ambassador Liu spoke highly of the strong momentum in China-UK relations. He said China is ready to stay in close coordination with the UK to map out a good plan for bilateral senior visits in the coming months and to strengthen exchanges and cooperation in various fields so that China-UK relations could yield more "golden fruits" in the "Golden Era". Sir Jeremy Heywood welcomed the strong and positive momentum in China-UK relations. He said the relationship is faced with greater opportunities after the Brexit referendum. He expressed his confidence in the future of China-UK relations and a fruitful "Golden Era" with joint efforts from both sides.